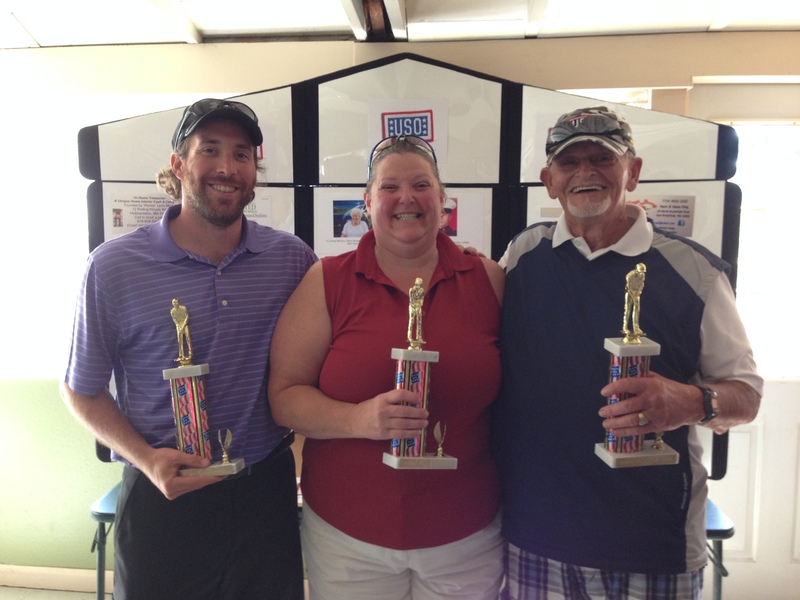 12th Annual USO Benefit Golf Tournament at Bay Path Golf Course – Success and Thank you! 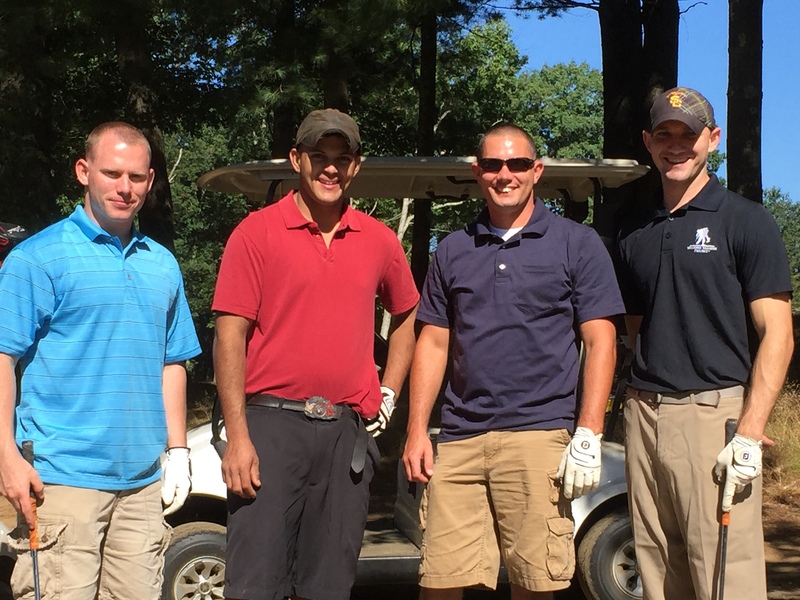 The 12th Annual USO Golf Tournament was held at Bay Path Golf Course in East Brookfield, MA on September 5, 2015. It does not seem possible that our event has now had its 12th go around! We had 65 golfers spread amongst 17 teams. This was down a bit from last year, but thanks to very generous hole sponsors we are very close to our annual goal to support the USO and the work it does to support our men and women in uniform. As for the event, the weather could not have been nicer. 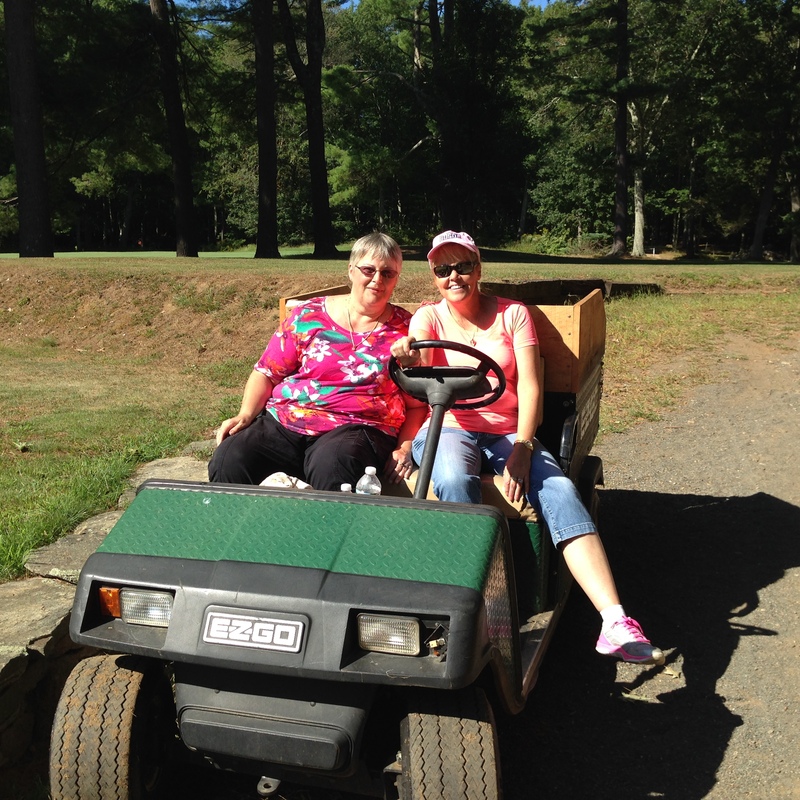 Jeffrey and Justyne Smith had the course in great shape and the clubhouse was packed. With a few late hole sponsorships still pledged to come in (and yes, I can still take them just send me a message – all it takes is a check written to the USO! ), we should just be shy of raising $6,000 for the USO! This brings our total for the time we have had the event to over $46,000! Thanks to everyone who donated or competed! Please note that we had some late donors who did not make the wall but who should also be acknowledged as well – Ed LaFlamme from Ken’s Citgo in East Brookfield, Ted Boulay from Voya Financial in East Brookfield, and Ron Lacaire from East Brookfield. Thanks! As for the event, it was a very competitive event. Here are the results – the 50/50 on the par-4 2nd hole was a closest to the pin on the second shot over the pond. 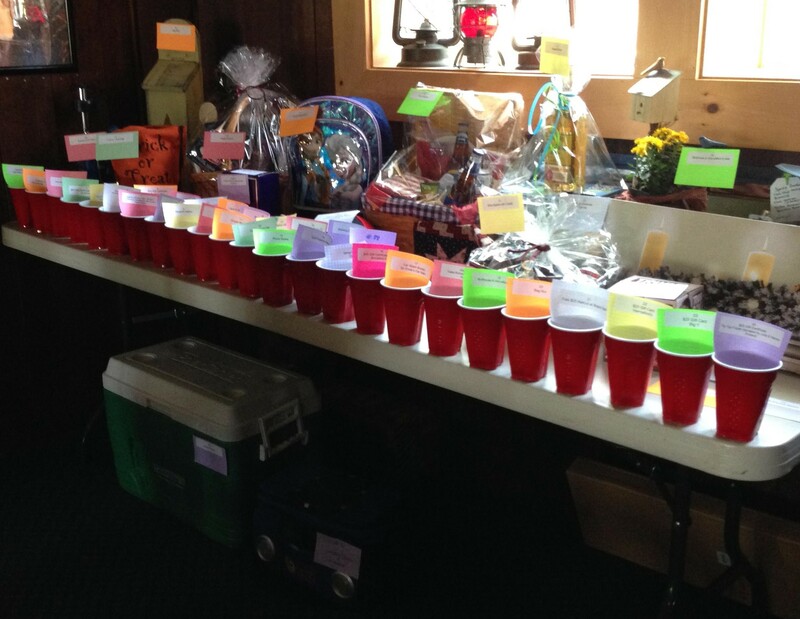 This was won by Nick Guerin at 14′! There were 5 skins – won by Jerry Dufresne, Pit Caron, Kyle Waterman, Jim Hemenway, and Stacie Chandler. As for our individual winners, we used the Callaway scoring system. Nick Guerin shot 82 and had a Callaway score of 71 (-1) to win best scoring Male golfer. Stacie Chandler shot 85 and had a Callaway score of 73 (-1) to win best scoring Woman golfer. Bob Tilton (age 83 and 2 days) shot 74 and had a Callaway score of 72 (Even) to win best scoring Senior golfer. As for the top three teams, as a USMA grad it pains me to say that both Air Force and Navy beat the best Army team (which was my team), but congrats nonetheless! We also used the Callaway Scoring System for team play. 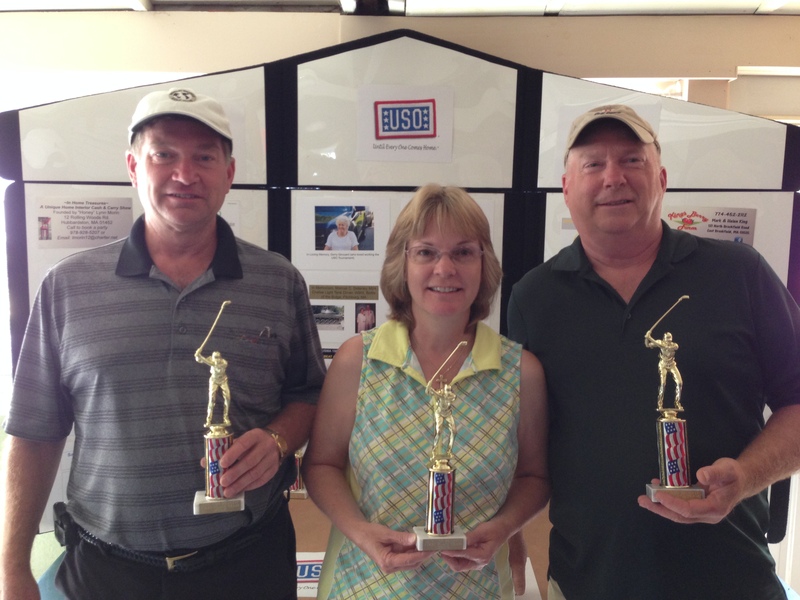 The 1st place team played for the US Air Force, and comprised Jim Kularski, Lisa Kularski, and Mike Kularski, and had a score of +3. Congrats to the Kularski’s! There were three teams at +4, so it went to a couple of tie-breakers. 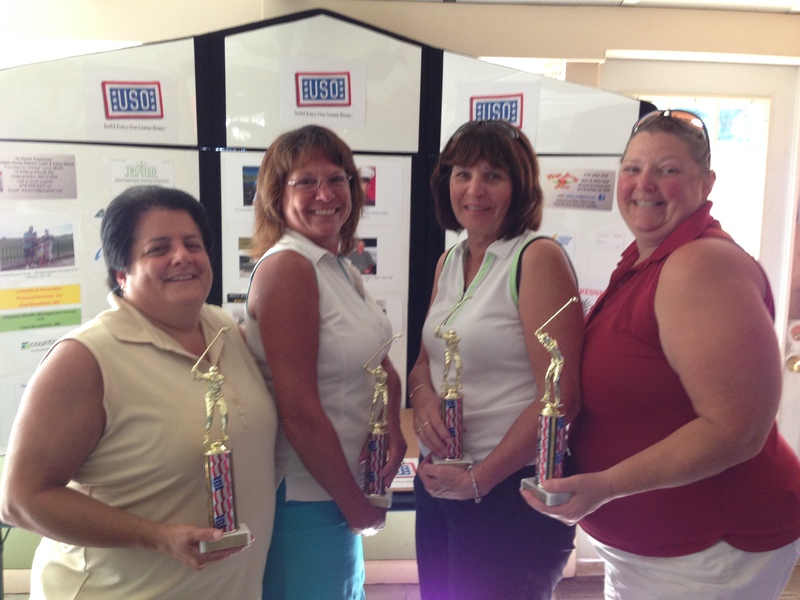 The second place team played for the US Navy and comprised Michele Holm, Ellen Morse, Stacie Chandler, and Denise Bruso. Well done ladies! ARMY TAKES 3rd – The 3rd place team was mine, proudly playing for the US Army. My teammates were Bob Tilton, Russ McGee, and Jerry Dufresne. (I did not get a picture!). Thanks for playing with me guys – and watching an 83 year old shoot (Bob Tilton) 2 over par is a great spectator event for sure! There were some nice side stories as well. Jim and Janice Howe from Colden, NY sponsored an entire team of US Marines (Jason Thompson, James Dea, Carlin Monroe, and Austin Ahmed) from Springfield, MA. They had a great time and were very thankful for the sponsorship! These Marines are buddies of Russ McGee’s son and Bob Tilton’s grandson, Bobby McGee, who was killed tragically by a wrong-way driver on the Massachusetts Turnpike in 2012 as he drove to his USMC reserve weekend drill. You can see a picture of Bobby on the 2015 Hole Sponsorships link above in this blog. This event for the USO reunited them and Janice and Jim, you really did a nice thing! It also was a great reminder of the main reason we do this – support of the troops and the great work the USO does in support of our men and women in uniform, of whom we are so very proud! Myself & Lynn Supporting the USO! LAST BUT NOT LEAST! Special thanks go out to the committee for all their help. An event like this is a lot of work! Without these folks and their dedicated help this event could not happen: Jeffrey and Justyne Smith for all the support from Bay Path; my lovely wife Lynn for her baskets, her help signing folks in, her work at the 8th Hole Contest, her well-received desserts, and overall help, love, and support; Jerry Dufresne for his help with the door prize raffle and the set up; Ray Lareau, Sr. for his help with the 50/50 and the scoring; Bob Tilton for his help with the Skins and the set up; Jim Hemenway for his help with the set up and the scoring; JP LeBoeuf for his help with the sign in, the scoring, and getting sponsorship; Debbie Rice for her help with the raffle and the 8th Hole contest; and Lisa Kularski for her help with the scoring. Of course, thanks to all the golfers who supported this event! Let’s keep this going next year! 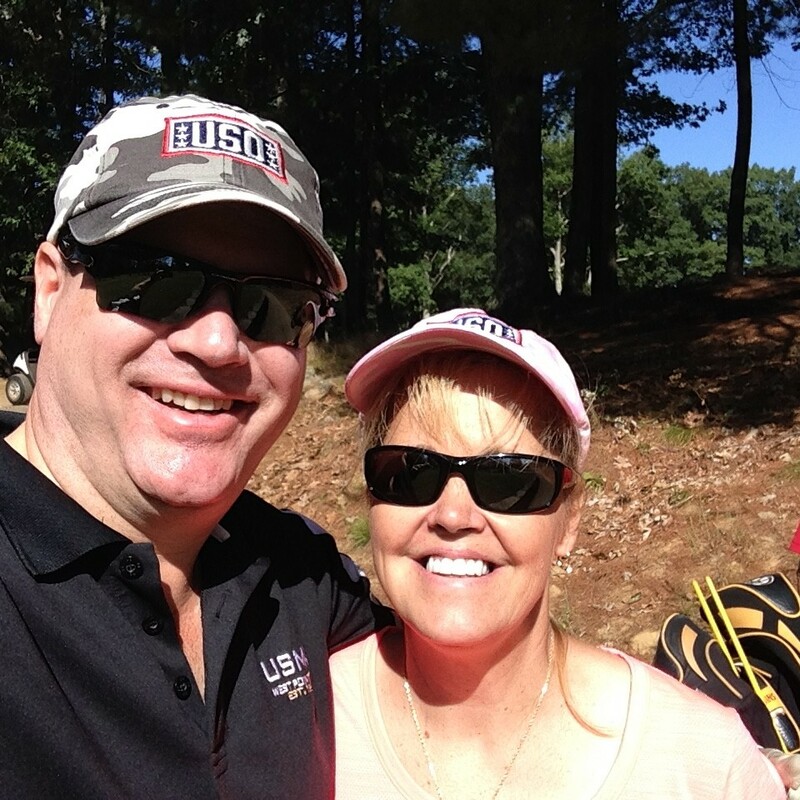 Author Mark A. MorinPosted on September 6, 2015 September 6, 2015 Categories Golf2 Comments on 12th Annual USO Benefit Golf Tournament at Bay Path Golf Course – Success and Thank you!